With online shopping rising in popularity, it's vital to make enhancements while add functionality before the early birds begin buying holiday gifts. Here are some methods you should be implementing to ensure you are capitalizing on increased traffic. 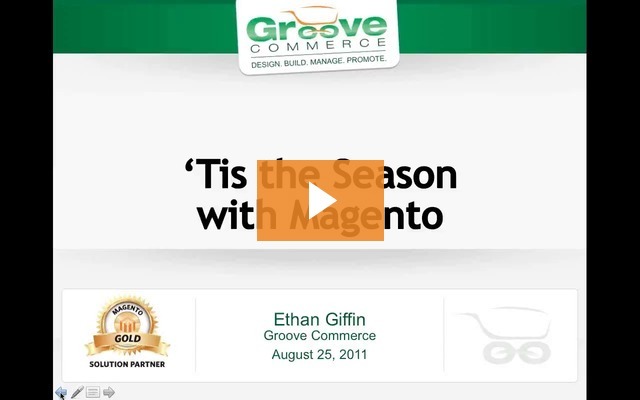 Watch our webinar:Tis the Season with Magento. eCommerce sites in most industries will experience a huge spike in traffic during November, December, and January due to holiday shopping traffic. With online shopping rising in popularity as people strive to avoid lines and crowds, it is vital to make enhancements and add functionality well before the early birds begin buying holiday gifts. This webinar describes some methods you should be implementing to ensure you are capitalizing on the increased traffic this year. Mack: All right. Good afternoon, everybody. Thanks for your patience as we let some people log on. We’ve got a great group today. I am Mack McGee. I run Sales & Marketing for Groove Commerce. We really appreciate you joining us for what should be a very informative webinar today, which is all about prepping your site for the holiday season—a big thing that we’re getting folks ready for right now despite the fact that it’s August. We’re getting things in place that will be successful. As always, our monthly webinar will be led today by our CEO & Founder Ethan Giffin. Ethan leads a lot of our consulting for our clients. And we’re currently working with a lot of them through our online services team to bring your site into the holiday season. We’re going to go through today’s hit list of what to get done. We’re going to make sure your site is ready for what, for most of our clients out there and for most etailers out there, is the busiest time of the year. So with that, I’m going to turn things over to Ethan. Very informative session today. Lot of material that we’ll cover. Obviously this will go out after so you’ll have all the slides. Feel free to send questions in and we’ll get to them towards the end of today’s session. We’ll also have several interactive polls. So with that, turn it over to Ethan and we’ll get going today. Ethan Giffin: First off, I’d like to thank everybody for getting on the webinar today. We’ve got some great tips that we’ve put together to help from a holiday standpoint in terms of optimizing your site and increasing your traffic and conversion rate at the same time. I think what we’re going to do is we’re going to get started with our next slide, which is a question. So we’re going to put our very first poll out there. The poll is: Have you started preparing for the holiday season? If you could go ahead, folks, and answer the question: Yes, no, or it’s currently in progress. We’d love to know how you’re doing. All right. The votes are coming in. It looks like about half of you, or more than half of you, say no. We’re going to go ahead and close that poll and share the results. Very interesting results. 19% of you said yes, which is great. 57% of you said no. And 24% of you said currently in progress. So the no’s out there, the 57% of you, there’s definitely a lot of things that you can take out of today’s webinar. Those that are yes and currently in progress, I hope you can pick up a few tips that will help you even further. Going in, let’s go ahead and get started. We’re really talking about Groove’s Holiday Checklist. So let’s go ahead and get started and dig in through this checklist. It’s broken down into several sections. First, you want to audit your category and brand pages. You want to go through and look at most or all of your major category and brand pages. Make sure the page appears properly. Make sure the content on the page is what it should be. And really just double-check before the season to make sure that everything is good. Next off we’re going to add the holiday touch to your logo. Google does it regularly, so why not you? So, if you can, go in and add some holiday flare to your log. The next would be to winterize your theme. How can you bring some winter elements into your theme, some Christmas and holiday elements? Many folks like to launch those right around Thanksgiving or slightly before. The thing that you do want to do is you want to make sure that you have a timeline for removing that as well. And those are great things that you could schedule within Magento to winterize your theme. So you are able to do that, as well as optimizing your 404 error page, to present any holiday offers and things that you have out there. So look at your 404 page. Make sure it’s not just “page not found”. Let’s think about how you can optimize that and include any offers that you’re offering for the holiday season. Add holiday words to your site search. Make sure that you’re going into your site search, if you use a third party, and your adding words like “gifts”, synonyms, whatever it may be that people are looking for around the holiday timeframe. Go back to your Google Analytics last year, review that, and add those words into your site search so that they’re getting picked up and you’re presenting proper results back to folks. Next we want to enable the wishlist feature within Magento. Many folks don’t do that. It doesn’t work for every retailer. But if you can make it work for you, enable your wishlist feature. I know as a kid I used to get the JC Penny catalogue and create a wishlist. Now with everything online, it’s very, very easy to do that. OK. Don’t let them abandon you. We’re doing some really interesting things with shopping cart abandonment. I would be looking at that and saying: How can you make sure that people aren’t leaving your cart’s process and moving on to another site? Don’t let them do that. Come up with some emails along the way so that you can reach back out to them from an abandonment shopping cart standpoint. Let’s go on to the next. Create a buyer’s and gift guide. This is an example from Edible Arrangements. They’re helping people to show gift guides, shop by recipient, centerpieces, the perfect gift. Think about how you’re creating gift guides and driving people through the sales process. Review your infrastructure. This is something that we always tell people to do. And again, with the holiday season coming, it’s all about monitoring your site, going through a little checklist. If you don’t use a third-party monitoring service, there’s a lot of great ones out there. Some like Alert Site. You want to start to review your transaction levels. Make sure that your system can handle things. Look for 404’s. Start to think about how you can decrease the load time. If you need to, make sure you call Chris over at Nexus and add additional services into your sever infrastructure. Site speed definitely affects conversion. If you need additional servers, some people go really cheap on this and it’s actually the most important aspect of your business, is your web hosting and your site speed. Let’s keep going. It’s time for question #2. Mack, I’m going to let you take this one. Mack: For Question #2, we’re curious as to what you’ve seen in past holiday seasons really change the most about your site. Is it traffic, average order value, or conversion rate? I’d love to get everybody to kinda weigh in on this. Something we see across the board. It changes depending on who we’re dealing with. And sometimes the comment element may be one or two, but curious to see. It looks like the results are in, so we are going to close this on out and take a look there. So, interesting there. We’ve got 73% saying traffic, 20% saying average order value, and 7% saying conversion rate. Some interesting numbers there, Ethan. Ethan: Very, very interesting. Traffic is definitely big. That is the peak time. Your average order value, you know, you really should be changing it around the holiday timeframe. If not, you are losing out on revenue and leaving it on the table. And your conversion rate should be changing as well, too, absolutely. If it’s not, there may be some problems with your site. Let’s move on. Let’s get into some gifts and promotions. There’s a lot of things with gifts and promotions that you want to think about. Be strategic about all of this. You don’t want to give away the farm. Many people do. They give away the farm and they give too much away in terms of that. You want to feature gift cards and gift certificates on the homepage. Many people are not doing that still. People are looking for unique gift cards and gift certificates to buy for folks. So why not put yourselves out there with that and drive people in that direction? They’d rather buy gift cards for something unique rather than the big-box retailers. Go big on Black Friday and Cyber Monday. Come up with offers around Black Friday and Cyber Monday. Email folks about that. Do one day sales. Try to drive some traffic and conversion through those two days. And then, make sure you email, email, email. That’s the biggest thing throughout the holiday season, is the repetition of emails, making sure that your emailing folks, re-emailing folks that don’t open the offers. There’s a lot of noise around the holiday season and you need to push through it. Next, you want to make sure that you’re aligned with social media. Make sure that you’re putting your offers, putting gift ideas out in social media. Putting all of that information out there so that people can see it and they can act on it. From a social standpoint, you don’t want it to just be offers. You want to make sure that you’re putting out ideas, recommendations. And you need a frequency with that as well, too. So again, make sure your Facebook and your Twitter are updated with offers and gift ideas. One of the things we also think that you should look at is: How do you offer a physical gift card as well as the ones via email? You can still email them as well, but how do you send something out physical that someone can give as a gift? That’s one of the aspects of online shopping that people get frustrated with. So how you do that and introduce that is great. So, can you offer the option to say, whether it’s a gift card, gift certificate, whatever that is based upon your size, that’s fine. If it’s a gift card, it doesn’t have to have like a magnetic strip or anything. It’s just something physical that the person can give as a gift when they’re giving it out. So think about how you can offer physical gift cards and gift certificates when you’re doing holiday shopping. Offer gift wrapping and messaging. A great way to up your average order value, if you can do it, is to offer gift wrapping. Through Magento, there’s great options in there to offer different types of gift wrap and allow gift messaging. You just have to set it up and enable it. It’s a good way to add $8, $10 average order value to the orders. Use bundles to create gift sets. Allow your visitors to bundle things together and buy unique gift sets. That’s a very, very easy thing to do. Set those at various price points-- $24.99, $49.99, allowing people to buy gifts at various levels and bundle multiple items together with that and make something custom when they’re giving those gifts. A great way, again, to build your average order value. A few things around shipping and customer service. We like to keep it simple. The one thing that people want to know around holiday shopping is they want to make sure that their expectations are met. As a smaller retailer, and when I say smaller, I’m saying you’re not Zappos, you’re not Amazon, you’ve got a lot to compete with. Amazon, during the holiday season—I’m sure a lot of you bought gifts from Amazon—they were shipping sometimes within hours or 45 minutes of the order taking place online. Zappos is very similar. That’s a lot to compete with. You don’t have to do the same things they’re doing, but you do need to keep it simple. You do need to set expectations with your customers. Clearly show shipping deadlines. What’s the last day for shipping that they can receive things before the holiday season? Set up a shipping timelines so people can clearly see, you know, when’s the deadline for ground shipping? When’s the deadline for overnight? If you can, offer flat rate shipping. One of the things that we see most affects conversion rate is shipping charges and some crazy formula for putting them together. If you can offer flat rate, simple shipping, we recommend that. When we’ve A/B tested it, it’s definitely affected sites’ conversion rates. Set a clear explanation about returns. When can people return things? Increase the timeframe in which they can return items. All the major retailers are doing it, so why shouldn’t you? You want to make sure that you are protecting yourself within that with proper rules and policies, but setting a clear explanation on those returns and increasing the timeframes may help someone purchase from you. And also, add additional hours for customer service. If you are on the East Coast and you have strong orders into the evening, why not add three or four hours onto the day where you can offer additional phone support and live chat? Again, if people want to be able to reach out and touch someone…I’m still surprised every day when we talk to e-commerce etailers that don’t want to be contacted by a phone or chat. Those are elements that will help you to drive more orders. Next, this is an example from Nordstrom’s shipping timeline. Most retailers are just starting to put that information out there for the year. But I would say by the end of September, October, you should have many of these changes done to your site and you should have a clear shipping timeline for the holiday season published. Social media and marketing. Everybody’s favorite topic lately is social media. You want to start pushing for reviews now. That user generated content is going to, again, reassure your visitors. It’s just good to have from not only an SEO standpoint, but from a conversion rate standpoint. So start pushing visitors now to come back and review items. I would figure out a timeframe, whether it’s 20 days, 30 days, whatever, after shipping to go out and resend those folks an email asking them to come back. When you’re creating your holiday themes for your site, do the same thing for your Facebook and Twitter. Create a welcome page for your Facebook, create a background for your Twitter that’s holiday related. Again, push those offers and gift ideas socially. In terms of your pay-per-click, why not create a sense of urgency in your pay-per-click ads? Start to introduce ads where, “X days left in the holiday season.” Add words like “gift” to your pay-per-click campaign. And why not send your customers a holiday thank-you email and even offer a coupon code in the email so that they can come back? The sense of urgency—“10 days left to order”, it takes a little bit of time to align those ads and get them going. But if you do them the right way, you can make an impact. So it’s time for Question #3. Mack, I’m going to let you put this out there and ask the folks a question. Mack: We’ve covered a lot today, obviously, Ethan. We’re going to ask everybody now: How prepared to you feel based on what we’ve covered? We’ve got some questions we’re going to get to in a minute, but we’d love for everybody to weigh in on this poll and see how people are feeling based on the results. All right. We’ve got almost enough of a majority to close this poll out here. We’ll go with that right there. Ethan, interesting results. We’ve got a very small part of the audience that is there right now. It sounds like the majority, nice job getting there, which is exactly where you want to be right now in kinda locking things down towards the first part of September. Then we’ve got a handful of people that are not ready at all. So, Ethan, what do you think of those results? Ethan: It’s definitely interesting results. I think the big thing about holiday shopping is it’s really getting back to the fundamentals. You should be doing all of these things all year, it’s just you’re introducing a holiday theme that may have snow or other holiday Christmas or other holiday elements within that. So really think about that as you’re going through it. There’s nothing groundbreaking you should do, it’s just you should do it early, you should be prepared September/October, and be prepared for the holiday push. Interesting question that came through: How often should you post of Facebook? That’s a great question. It’s different for everyone. Going through that process, there’s a lot of noise of Facebook and Twitter. The thing that you’ll find is people get annoyed when you post too much, but then they miss your message if you don’t post enough. So depending on the size of the base that likes you or follows you, that can vary. It could be a couple of times a day if you have interesting things to say, or it could be once a day if you don’t have things to say. I would try to update your Facebook a couple of times a day if you can create enough content to do that. If you are tweeting, I would say there’s some interesting tools out there to schedule your tweets and to be able to re-tweet things that you’ve posted before using different creative and see if you can get more clicks on the links on you tweets. And then schedule those throughout different times of the day and different days of the week. You can get a lot more traffic with that. A lot of people just kind of tweet once and then forever hold their peace. Again, I don’t think you should do that. I think that you should try to put more tweets and more Facebook updates out there. Mack: Ethan, a couple more questions have come in, one of them being, so, the big thing that you’ve been talking to a lot of our clients about is that during the holiday season you get a lot of visitors who normally aren’t shopping your site because they’re there shopping for a friend that uses the site. Can you talk a little bit about that and the psychology, why you brought up the buyer’s guides? Ethan: I think anytime you can drive people to specific products and kind of…People are stupid when they are online. There’s no doubt. So it’s really keeping it simple. It’s driving people to actually buy something. Yeah, these may be new visitors to your site that are coming. So whatever you can do to engage the visitor, especially from the homepage, drive them to buyer’s guide, drive them to particularly products, and then making your checkout easy and simple will help you increase your sales. The question is, then, can you go out and take those first time customers that have bought over the holiday season and turn them into long time customers? Mack: Ethan, next question that came in. People are really curious on the gift wrapping aspect. When you are offering that online, dollar value, obviously, is going to vary from company to company, but where should they present that? Product page, cart, both? Ethan: It really just depends. Those are things that I’d want to test. I would mention it on the product page. Definitely mention it on the product page. Some people like to do it on the cart page as well and it works better. I would definitely think about the quality of the gift wrapping product of the paper and other elements that you’re providing and then align that closely with the pricing of that. It’s definitely an up-sell that people like to see, and not enough mid to smaller retailers offer that. Sometimes I think it’s just out of the complexity of wrapping the gifts. But I think it’s definitely something that every retailer should look at and figure out how to introduce. If you are selling plumbing supplies, then this webinar probably doesn’t fit with you. But if you are selling items that could be gifted, I would really think about that. Mack: Next question was, Ethan: Is there anything out there you’re seeing that’s really a mistake? Something that you’ve seen from holiday shopping online? Ethan: Definitely, like I said, I would keep things as simple as possible. I wouldn’t hesitate to have opinions about the products that you sell. I think the one mistake you could make is not having an opinion. I would say we’ve talked to some retailers that have seen almost too much political correctness in terms of holidays and things. Folks that dress their sites up for the holiday seasons are seeing increases in conversion rates. So again, what works for you is important, but I would say the mistake would not making it simple and not having an opinion. Another question came in that I just saw: What about a lay-away plan? That’s an interesting opportunity. Sites like Bill Me Later are kinda like the modern day lay-away. If you could make that work within your infrastructure. Most of the retailers that we talk to aren’t really set up to break down those payments without utilizing a third party. But if you have larger, more expensive items, a payment plan might work. Or something like Bill Me Later, if you can qualify to utilize them, it may be just as good. Mack: Ethan, next question came in around people are purchasing products for other people. We talked about product reviews and the opportunity get them, obviously, with the surge in traffic. But maybe the person placing the order isn’t the person using the product in the end. Any recommendations around that? Ethan: Some folks only want to allow the purchaser to leave the review. I would definitely open that up. Reviews are hard enough to get anyway. You could add some messaging to your review emails to say, “If this is a gift, please feel free to forward this on.” There’s ways of doing that an opening that up. So make it as simple as possible for folks to leave reviews and ratings on your products. Mack: Great. We’ve covered all the questions that have come in at this point. Any final tips, Ethan? Ethan: No. I think the one thing that we’d like to offer folks is if you’d like a 30 minute holiday prep consultation, we’re offering that for qualified companies. 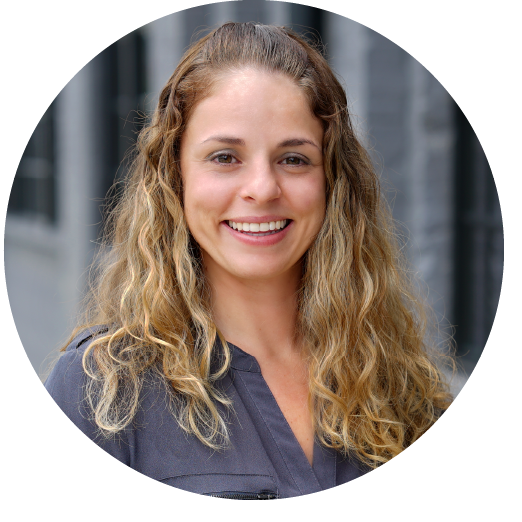 Reach out to robyn@groovecommerce.com and we can get that scheduled. But the one thing that I’d like to add is think about the holiday season. Think about your timeline. And think about the little things that you can do to make your site better. Again, many of the retailers that we work with do 60% or 70% of their business between October and December every year. So how can you maximize that potential by looking at and fixing the little details on your site? Mack: All right, great. Well, Ethan, thanks as always. We appreciate the advise. And thanks, everybody, for coming today and joining. Any questions, obviously, feel free, if you are interested in this 30 minute consultation, reach out to Robyn or check out our website form and feel free to send in that way. We’ll be sending slide decks out afterwards as follow up. Our September webinar should be out in the next week or so with date and topic, so we look forward to that. Still some internal debate of what we’re going to cover next. I appreciate everybody coming out today. Have a great afternoon. Thanks guys.